I don’t like it when one of my students gets sick and misses multiple days of school. I cannot control the ravages of flu and other infectious, highly contagious diseases; I merely observe the ramifications of their rampage. The students who make life fun are especially missed. I miss my daily banter with them. A little bit of sparkle is missing from my everyday routine. My eyes stray to the assigned seat; I sigh to myself and enjoy the bright-eyes faces of the ones who are there with me. We sometimes deepen our rapport on those days. On the other hand, I notice that the students who make life challenging sometimes leave me holding my breath and wondering about how the chemistry of the class will shift again to “normal.” I perceive that I am more relaxed and open in my affect; my intuitive students pick up on it as well. When my challenging-to-me personality returns, I once again clamp down on procedures. My expectations never relax. I simply feel at ease to joke with my class again like I did before I unearthed the one or two persons who are too thick to understand my humor or take it in an improper vein. Some years I have multiple students who force me to earn another grey hair or two. Understand this: I never want any of them to be sick and to miss school. I just want the hearts of some of them to change for the better. I want them to make good decisions and to behave properly. I want them to concentrate on school and its priorities and not any other circumstances. We had two days of state testing aka STAAR with our students. I let them listen to our novel we’ve been reading after the testing concluded today and yesterday. I had already made them finish reading on their own and thought that listening might benefit them. My colleagues took their classes outdoors. I wasn’t dressed for the occasion with four-inch strappy sandals on my feet, so we relaxed indoors. I even began to redecorate my classroom during my conference period. We are required to remove any instructional writing or posters from our walls. Motivational posters may be all right, but I took no chances and only had the pledge of allegiance to the American and Texas flags visible along with the safety information that we’re required to post for quick reference. I know the students are relieved to be done; we teachers who are proctors share their relief. I am also glad to have my classroom back to “normal” setting with its colorful, eclectic display of motivation and instructional works. Tomorrow will find me posting their haiku poems we created for National Haiku Day last week on April 17. Last year, I wore my yukata kimono with obi for Haiku Day; this year I’d already worn it for the day we reviewed foreign language vocabulary since that’s one of the words on the school district’s list. 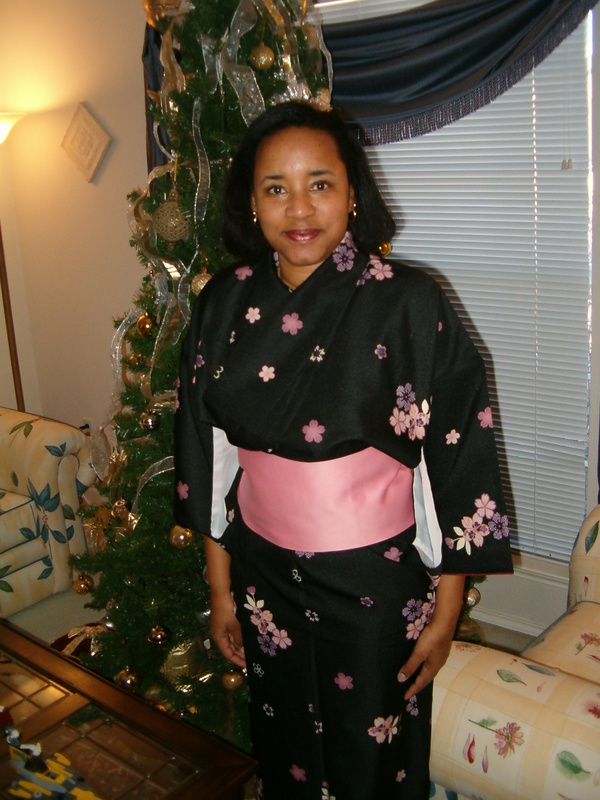 I’ve included a picture of me in my kimono below. My young charges like the fact that I don unique clothing/costumes to tie in to what we’re studying that day. I come by it honestly since Mama matches her clothes and dresses thematically at times. She is a Red Hatter, so she’s the proud owner of a few red hats and purple dresses to accompany them. It’s part of the costume. I relish the day I get to join her group. I’m still not old enough yet. ¡Ciao! Today, and I kid you not, I saw a student leaning his head forward his mouth (and perhaps tongue!) on the door and door frame of my classroom. He was the first in line to enter my classroom for the class period. I walked up to him and said,”You’re being disgusting. Get out.” This translated to him going to the office (short-term removal) for inappropriate behavior. My other students waiting for me saw me disinfect my door way where Mr. Lips had been. I’ve even seen him chewing on his hoodie string with gusto. I really didn’t know what to say since I’ve never seen that before in my nineteen years of teaching. Students aren’t allowed to touch cleaning products that could be potentially harmful, so he wasn’t going to clean that mess off for me today. I have a former colleague who didn’t like to see kids sliding along the lockers. It was as though they were trying to blend in with the scenery; however, they were the only ones in the hallway. It makes sense to compact yourself in a huge group. When you are by yourself, wall-sliding isn’t safe. I fear sneeze and/or cough residue. There could also be restroom residue because not everyone washes her hands after leaving the restroom. Gross! This is a good poem to keep handy for the dark days and hours. I found it on the site www.psalm40.org. If this poem was helpful to you, please copy and share it with my blessing. I wish I’d written it, but I remember a wise friend gave me a copy years ago, and I only recently recalled its existence. The written word is a powerful tool and a balm for a hurting soul. Psalm 8:4 says “In peace I will both lie down and sleep; for You alone, O Lord, make me to dwell in safety.” I have to put my thoughts, worries, and prayers into His hands and know that He will hold on them for me through the night. I have to believe that He gives me enough rest for each day I face with my young charges. ¡Ciao! My mother gave this poem to me when I first started teaching. I look at it at least once a year. Well, Father, what do You think? The room looks nice, doesn’t it? Breathe in. Breathe out. Relax. Relax. like the first day of the rest of my life. in addition to all the personalities in it. than the sum of its parts, and all that. I think that just about covers it, Lord! Just one more thing, Lord. You’re not going anyplace are You? More anon, dear ones. ¡Ciao!